Harpoon Classic was the first computer Harpoon game and probably the world’s best naval game when it shipped from Three-Sixty back in December 1989. Three-Sixty continued selling and updating the product until early 1994 when the rights reverted back to Applied Computing Services Inc., the original developer and rights holder. Alliance Interactive licensed the code and rights from ACSI in mid 1994 and developed Harpoon Classic for Windows 3.1. In 1996, Alliance licensed Harpoon Classic ’97 to Interactive Magic, which developed the game further to Windows 95. Work commenced upgrading Harpoon Classic 97 to Harpoon Classic 2002 Gold in the early 2000s thanks to Byron Audler, Don Gilman and the orginal HCE Team. Many new and exciting features were incorporated into the game laying the basis for what was to come. After work was completed and Harpoon Classic Gold shipped, Anthony Eischens and the rest of his team at HarpGamer took the reigns evolving the game into its current form, Harpoon Commander’s Edition (HCE) which is published by Matrix Games. If you are a fan of the original Harpoon Classic game you will enjoy this upgraded version. When released, the Harpoon 2 and 3 simulations were the most complex, realistic and accurate strategy-simulation of air and naval operations available to non-military users. Harpoon II was the MS/DOS version of the simulator. It was first released in 1994 on six 3.5 inch floppy disks and contained the battleset Global Conflicts One. The Global Conflicts Two and Three, Cold War, Westpac, and Regional Conflicts One battlesets were later released as add-ons. The next version, Harpoon II Deluxe Multimedia Edition, an improved version released on CD-ROM, contained the three battlesets Global Conflicts One, Two and Three as well as many new video and audio clips. It also included a printed manual and a scenario editor which allowed you to build your own scenarios. The final version was Harpoon II Admiral’s Edition. This had all six previous battlesets plus a new one, Regional Conflicts Two. However, being a MS/DOS application, Harpoon II suffered from severe stability problems on Windows 95, 98, ME platforms and would not run at all in pure 32-bit operating systems like NT 4.0, Windows 2000 and Windows XP. Because of these shortcomings, Harpoon II was ported to Windows and renamed Harpoon 3. Harpoon 3.6 was the vastly improved Windows (Windows 95, 98, ME, NT 4.0, Windows 2000 and Windows XP) and Mac (OS and OSX) version of Harpoon II. Harpoon 3 for PC was released in February 2002 while Harpoon 3 for Macintosh was released back in 2001. The simulator contained a myriad of new features and bug fixes, too numerous to mention all. Many people consider 3.6 the definitive version of Harpoon3, and was the last version of the game that the HarpoonHQ (now WarfareSims) supported. Harpoon 3.6 is still sold by Matrix Games and is bundled with ‘Larry Bond’s Harpoon – Ultimate Edition’. The HarpoonHQ’s (now WarfareSims’) DB2000 database and scenario project was started in late 1996 and produced the most accurate, detailed and realistic dataset available for any commercial naval / air simulator of its time. The database contained more than 5000 ships, submarines, aircraft and land facilities plus about 1900 weapons. In other words, the complete 1980-2015 Order of Battle for more than 60 countries. For example, the US Navy F/A-18C has a separate database entry for use after 1988, 1991, 1993, 1994, 1997, 1999, 2001, 2003, 2005, 2008 and 2010. The F-16 is represented by 149 database entries to cover all operators, main versions, subversions and progressive weapon upgrades, while the Ticonderoga-class Aegis cruiser has 79 entries that cover all major batches, upgrades and weapon / sensor configurations from 1983 to 2010. In 2007 the HarpoonHQ changed name to WarfareSims and the DB2000 database for Harpoon3 was completely rebuilt for the Command: Modern Air/Naval Operations simulator. The vastly improved database is known as the DB3000 and is far more detailed than its predecessor to support the new simulator’s advanced models. The DB3000 for Command v1.04 contains just over 9000 ships, submarines, aircraft, land facilities and satellites, and more than 2850 weapons. Harpoon 3.7 Advanced Naval Warfare (ANW) was the next version of Harpoon 3 which added Multiplayer and many significant changes to the simulation. This version was still under development when all further work was suspended in 2013. We believe the release of H3.7 aka ANW was controversial as it encompassed both positive and negative elements. On the positive side, multiplayer (a longstanding desire of the community) was finally implemented, and a few bugs present in v3.6 were fixed and some UI enhancements were added. On the downside the new version also presented significant problems. Hundreds of new bugs surfaced, many of them show-stoppers in severity and affecting the vast majority of community scenarios and databases. Worse, the development team failed to communicate the numerous code changes to third-party developers with enough time and information for the necessary adjustments to be made. Unfortunately, after a series of incremental patches, this situation had not improved substantially. In fact some people believed that six years of ANW development had done nothing but severely worsen the overall quality of the software, and when development ended in 2013 the game still had a large buglist. Some of the problems were obvious, e.g. game crashes or units performing outright stupid actions. Other flaws were more subtle; for example both friendly and enemy AI would behave significantly different than what it had been instructed to. Third-party content painstakingly crafted over the years (and working fine in pre-ANW versions like v3.6) had been rendered semi-inoperable. Much of this was due to bugs or features that were never articulated completely to the user base. While we understand the developers have a right to make changes to their game it probably would have been in the best interest of all to let everybody know, particularly if part of your advertising strategy is pointing at the quality of third party HarpoonHQ (now WarfareSims) content. Many of the game models were reverted to the models used by the paper rules system. While we understand the designers right and desire for more parallels between the paper and electronic versions we think the processing power of a computer should have been taken advantage of. In our opinion, reverting to a rule set designed for the human processor to efficiently solve at the gaming table was not a step forward for computer Harpoon from a modeling/simulation viewpoint. Additionally, AGSI and Matrix never capitalized on the chief improvement of ANW, multiplayer. No MP server was offered by either company, more than 5 years after ANW’s official release and more than 10 years(!) after MP beta testing commenced. This effectively left MP at ad-hoc community servers and showed a profound lack of trust to the game by its very own creators. Had they felt good about this feature they would have clearly invested time and resources into its success. 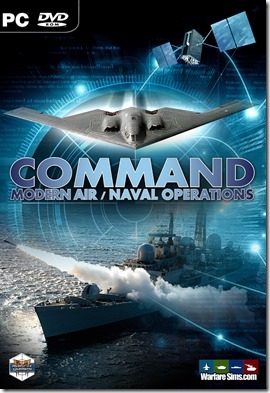 This situation, and the lack of evidence of real progress in the game, forced the majority of the community (including the content creators at HarpoonHQ) to concentrate on supporting pre-ANW versions like v3.6, and eventully inspired us to launch the development of our own simulator Command: Modern Air/Naval Operations.